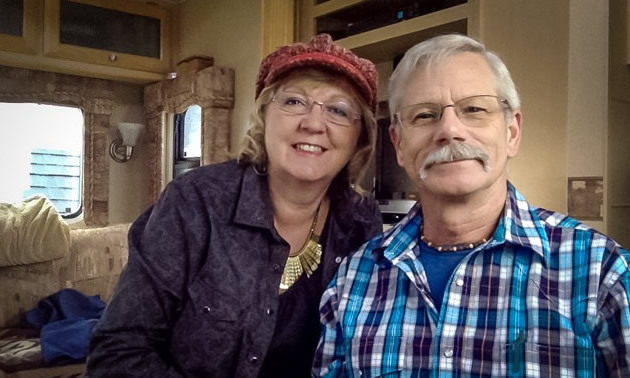 Full-time campers Deborah and Ross Hinter hope to inspire others to follow their lead. Before 2015, the Hinters weren’t entirely new to off-grid living. “We lived off-grid for five years in a log cabin, so we are familiar with roughing it,” Deborah said. “The foundation is the same, but the implementation is different because now we have the freedom to roam and take advantage of opportunities. When we lived off-grid in our cabin, everything centred around leaving to earn an income.” Full-time RVing offers the flexibility they love. They can simultaneously live a minimalist lifestyle and pursue their passions. The couple hopes to inspire others to follow their lead. “It feels incredible to choose to not be locked in,” she said. 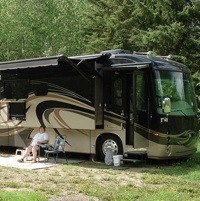 “If you have a desire in your heart to get out of the rat race, RV life might be for you.” While she admits that the minimalist lifestyle might not be for everyone, Deborah encourages others to jump if they want to. “There’s no reason you have to wait,” she said. The Hinters share their RV lifestyle on their YouTube channel: RV Life Canadian Style. “We get to explore different areas,” Deborah said. They document their travels, tricks and RV tips on their channel. “I did a video review on Meewasin Beach in Makwa Lake Provincial Park in Saskatchewan. That’s one of our favourites,” she said. They loved the solitude birdwatching in the marshlands—especially because Deborah’s other passion is photography. While Deborah loves photography and videography, Ross is a true outdoorsman. They created a second channel called Bushcrafting—Learning How, which is dedicated to Ross’ outdoor survival workshops, wilderness living, bushcrafting techniques including Indigenous smoke tanning, and related topics. Ross’ workshops lead the couple across North America as they follow the demand for his physical presentations. 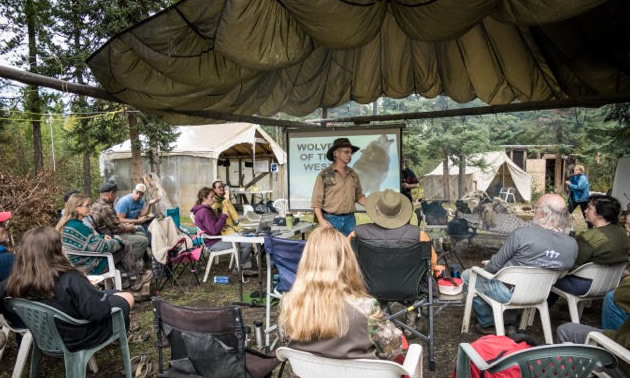 As a real Canadian wilderness expert, Ross also gives public presentations on wildlife preservation of wolves in Western Canada. “We’re all over the place,” Deborah said. 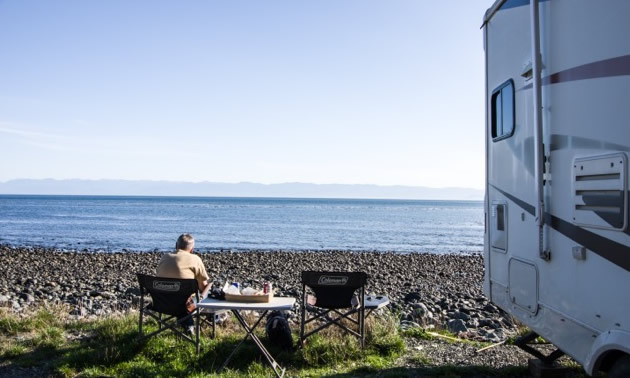 “Our dream trip is to go up to Yukon and Dawson, and then to the Maritimes to see my homestead.” Ross has never done the cross-Canada road trip, so the couple is especially looking forward to their chance to try it. As nomadic as their spring, summer and fall seasons can be, “in the winter, we stay put,” Deborah said. 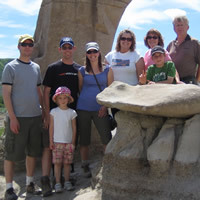 However, instead of racing south of the border like many other full-time RVers, the Hinters stay in Osoyoos in southern British Columbia. Despite their past experiences living off the grid, Ross and Deborah primarily learned to adapt to small-space living while on the road. “It’s a process,” she said. No matter how much research, no one is ever fully prepared. “We have a rule now on the road: if something comes in, something has to go out,” she said. Their advice for others hoping to ditch the daily grind: “Keep it simple at first. Minimal. 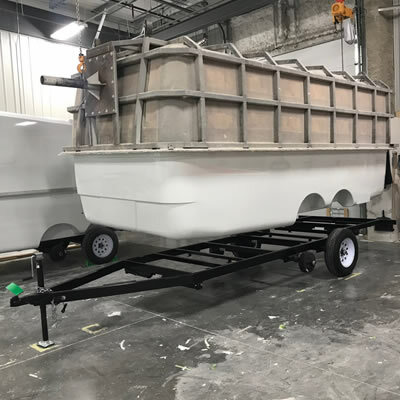 You can always build onto your supply.” Follow along with their travels on YouTube to see if RVing full-time is for you!